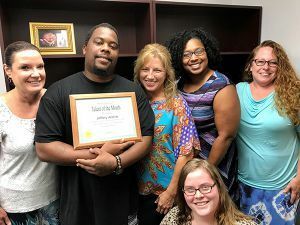 Jeffery Archie, a carpenter in Pensacola State College’s Facilities, Planning and Construction Department, has been named the July Talent of the Month by Kelly Services. Archie who has been with the college for 16 years was nominated by his supervisor, Diane Bracken because of his outstanding work ethic. Archie, who started working at the college at age 16, said he was surprised and ecstatic being designated Talent of the Month for July. Bracken describes Archie as a role model in her department. Archie said he was overwhelmed by the accolade. Dawn Hope, Kelly Services Account Talent Manager, is seeking nominees for Talent of the Month.